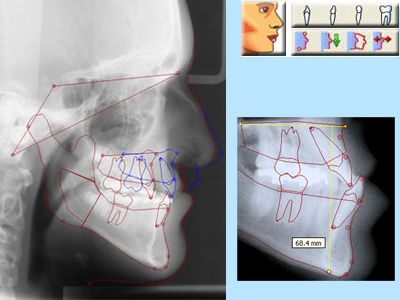 Facad is a software program used for orthodontic tracing, cephalometric analysis, and visual diagnostic imaging, as well as for treatment planning with soft tissue profile prediction for both orthodontics and maxillo-facial surgery. This program is meant to be used by dentists, orthodontists and orthofacial surgeons. VisiQuick is the official dealer for Facad® in Belgium and The Netherlands. 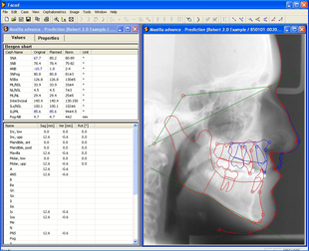 The software is developed by the Swedish company Ilexis AB in co-operation with the maxillofacial unit at the University Hospital in Linköping, Sweden. Facad has been in clinical use for more than 20 years and is available on Windows PC’s. 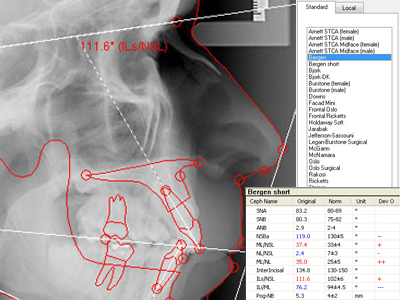 Tracing Only version – the limited edition that includes tracing, cephalometric analyses, tracing of hard tissue and soft tissue profile line, and superimpositions. 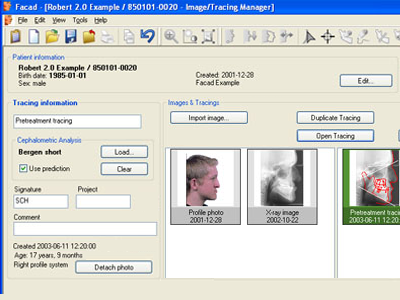 Full version – also including usage of profile photos together with x-ray cephalograms, and treatment planning (simulating movement of teeth and bone segments) with soft tissue prediction and prediction photo. Facad is available in English, Dutch, French, and several other languages. Supported operating systems: Windows 10, 8. 7 and Vista. Visual overview: (image thumbnails) with management of a patient’s images, tracings, treatment plans, and superimpositions. Multiple language support: English, Dutch, French, Swedish, Norwegian, Danish, Finnish, Spanish, Polish, and Slovenian. Documentation: Complete User’s Guide, Tutorial for getting started, well documented cephalometric analyses, release notes. Digital X-ray images: Cephalograms, Frontal X-rays, Panoramic X-rays. Cast models: Photographed, Scanned (2-D). Zoom: Enlarge/reduce in steps, Enlarge/reduce continuously. Rotate image (180°, 90°), flip upside down, or mirror left/right. 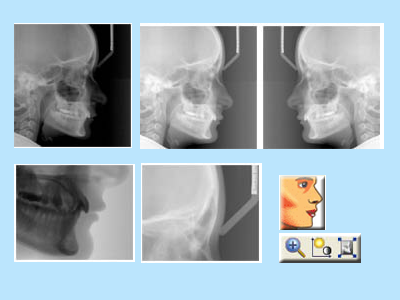 Superimpose a lateral x-ray with a profile photo with see-through effect. Superimpose two x-ray images with see-through effect. 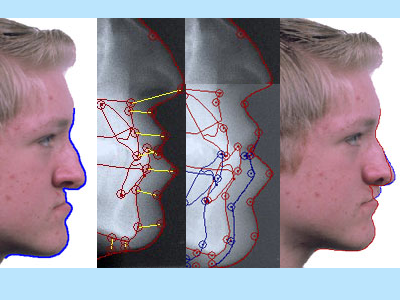 Superimpose 2-5 tracings simultaneously (before/during/after treatment, or during growth). Measure distances between tracings in a superimposition. Place only the markers necessary for the chosen analysis. Adjust the position of markers. Place/adjust markers with high precision. Place teeth using ready-made templates. Adjust the position, size and slope of teeth. 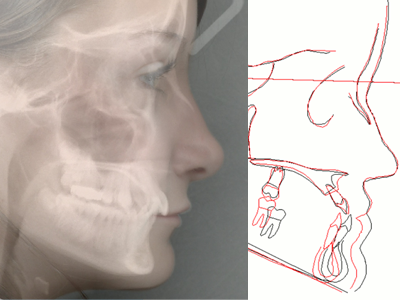 Draw hard tissue (maxilla, mandible, and other anatomical structures) using ready-made templates. Adjust the hard tissue structures. Draw the soft tissue profile line using a template and automatic structure recognition. Adjust the soft tissue profile line. Trace on either right or left cephalograms. Undo any actions easily, to correct for user mistakes. Correction of X-ray enlargement factors. Modify and custom-design your own analyses. Adjust norms intervals for selected measurements. Build your own analyses from a measurement library. Flexible graphic presentation of measurements, values, and cephalometric lines. Planned movement and rotation of teeth, maxilla, and mandible – with high precision, interactively or by entering numeric movement values. Immediate numeric presentation of planned movement. Simulate the use of distractors. Predicted photo as a result from treatment planning. Flexible model for soft tissue movements.